This is about the Howe family. In 1939, Carolyn Howe got married. One of her wedding presents was a 16mm movie camera. She took pictures of life around her in Falls Village, Connecticut. As she became more interested she started experimenting with color and composition. There is no telling where her talents could have taken her. Hollywood? But her creative abilities took her in a different direction. She stayed on the farm. And she started making documentary films about life on the farm. The baby has grown up to become Pete Howe who you will see in Pine Plains Views in Wednesday Jam. He and his brother, Jim, found these old movies and projected them on a wall and videoed them with a home VHS camcorder. All I did was some sraightforward editing and set them to music. Carolyn and her sons had done the rest. Your comments are more than welcome — they are invited! For example, does anyone know what that first tractor was, before the 8 N? I don’t know much about Pine Plains but I do know that I LOVE these videos. What a treat to see them. My father was a farmer in Falls Village from the 4o’s to the 6o’s and I remember the Howes well. My father couldn’t afford a baler so Mr. Howe would bring his baler over to our farm to bale our hay. 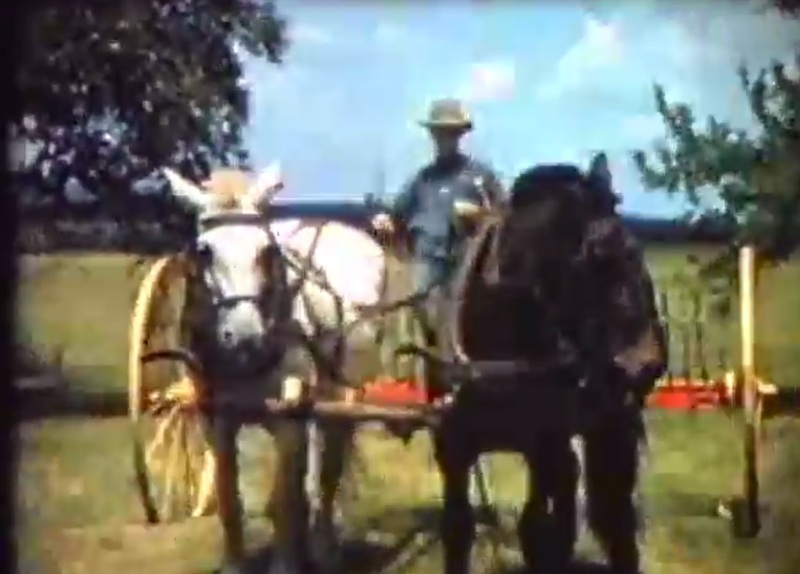 In turn, my father would help Mr. Howe with his haying. Back then there so many farmers in the area and they all helped each other at haying time. Mrs. Howe was a lovely lady. She was the “story-time lady” at our local library and had a real gift for working with children. When I was a teenager I used to clean house for her and remember well the great meals she fixed for her “farm men” at noon time. She was a very kind and generous lady. Such a nice person to work for. LOVE the music that has been added to these videos. They make me smile and remind me of a happy era. I wish there were more!